After making a complete fool of itself last week, with its faux story of an impending deal, The Sunday Times has returned to the fray this weekend with a mirror opposite. Without admitting that there was no actual deal last week, the paper has picked up on the manoeuvring of the May team as it struggles to find a form of words that will keep all sides happy. In this instance "Team UK" has happened on a sort of "Schrödinger's backstop", a permanent backstop that doesn't really exist because it isn't ever going to be used. And it isn't permanent because, even though it doesn't exist, it can be ended by a fiendish device called independent arbitration, when a third part body decides it's safe to abolish. This was going to be the magic wand that was going to get Mrs May off the hook and allow her to sign up to a withdrawal agreement which incorporated a legal commitment to a backstop. The EU would be happy and, in theory, the ERG-fodder would also be happy because, simultaneously, this would be a non-backstop. However, there has since emerged, one very slight problem with this cunning plan – the EU won't buy it. This means that Schrödinger's backstop has rematerialised and dropped dead in Mrs May's lap. She has nowhere to go but to bury the corpse. 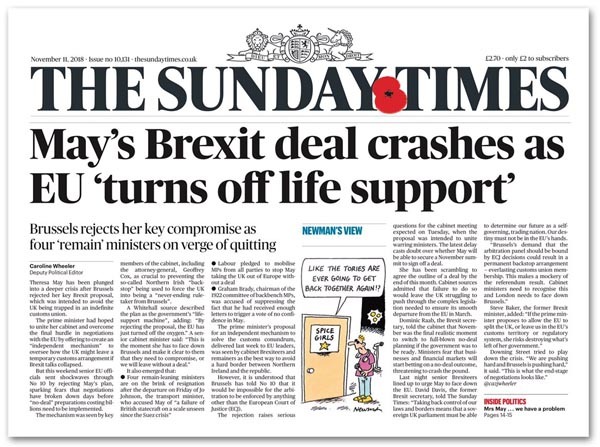 And it is that which has given The Sunday Times its story for today with a front page headline for its print edition, declaring: "May's Brexit deal crashes as EU 'turns off life support'". For all its busy-bee activity though, it was actually beaten to the draw almost 24 hours ago by HuffPost which yesterday was running the headline: "May's Brexit Deal Suffers Major Setback After EU 'Rejects' UK Arbitration Mechanism". Needless to say, we also had it on the blog which had me suggesting that Mrs May should be planning to leave the country under an assumed name. But also joining with us is the Independent. Not quite as dramatic as The Sunday Times, the paper merely talks of a "fresh blow" for Theresa May. Ambassadors, we learn, have been told that there has been "no significant progress" on the Irish border. Oddly, the text is tougher than the headline, talking of a Brexit deal being thrown into "fresh jeopardy". Crucially, it refers to an "optimistic" timetable, one floated by Downing Street after Dominic Raab had been presented with a legal text agreed by officials last Tuesday. From there, is seems, false hopes had been raised and it is those hopes which have now been dashed. The ambassadors have been told by Barnier's deputy, Sabine Weyand, that there was no agreement on the "Schrödinger's backstop", the infamous "joint review mechanism". Notwithstanding any of the longer-term effects, the immediate consequences of this "setback" is that there is next to no chance of agreeing an outline deal by the middle of next week. And, as the Independent helpfully points out, if that deadline is missed, it is unlikely that there will be a European Council in November. If December is now the earliest we can see a deal – and nothing is assured – the UK will be forced to put serious money into "no deal" preparations. Even then, to make that work, a huge rump of legislation has to be passed through Parliament. There is barely time. That, though, is the least of Mrs May's worries. The Observer is stealing the Telegraph's clothes by focusing on the turmoil in the Tory ranks, retailing accusations from former education secretary, Justine Greening, that the prime minister is planning the "biggest giveaway of sovereignty in modern times". This, we are told, represents part of a "potentially devastating pincer movement" from Tory remainers and leavers, uniting for the first time to condemn her plans. Greening has told the paper: "The parliamentary deadlock has been clear for some time. It's crucial now for parliament to vote down this plan". Typically, for an intellectually bankrupt Commons, they are throwing their weight behind the so-called "people's vote", which is anything but. And, if this actually got anywhere and the 2016 result was overturned, it would – as Pete notes - be the end of democracy. Leaving, he writes, did not have to be an economic calamity. There are ways to do it safely but in the end we lacked the political coherence and competence, not least because those responsible for doing this to us never any intention of respecting the vote. When you stand back from this, Leave voters have no reason to trust in our politics and that, to a considerable extent, explains why so many are uncompromising. The consequences of ignoring the 2016 verdict would be long-lasting and dangerous. The whole point of a having a voting system is to achieve regime change without bloodshed. While other nations riot, we go to the polls. Staying in the EU would send a signal to millions of people that change cannot be secured in this country without violence. The compact between the people and their government will be broken. That said, the one thing on which Mrs May has been entirely consistent is on her refusal to allow a second vote. And, in that matter she has the whip hand as so many MPs seem unable to understand that "no deal" is the default mode. All Mrs May has to do is stall and, on 29 May we are out of the EU. From then on, re-admission to the EU would be via Article 49, with terms yet to be stated, much less agreed. And if anyone wants to contemplate serious, nation-wide riots, all that has to happen is for a government to attempt to rejoin without a referendum. Basically, whichever way we look at it, Brexit is a political fixture. The terms of the Political Parties, Elections and Referendums Act 2000 preclude a snap referendum and, without an extension to the Art 50 period, there is no time for that contest. And, given the UK's deteriorating relationship with the EU, it would be a brave man who assumed that we would get more time. Assuming we do get some sort of a Brexit deal though – if got no other reason than the EU institutions and the EU Member States need more time to prepare – that it is pretty obvious that we are looking at an unholy mess. And such is the careless and inaccurate use of terminology that it's not even possible to work out, with any certainty, what might or might not be on the agenda. At the very least, we might see a tariff-free deal, but the weight of non-tariff barriers that are set to descend on us have the potential to crush the like out of the UK economy. When we start seeing reports that hospital food is at risk from a "no deal" Brexit and the Department of Health is writing to health trusts advising them to make contingency plans to deal with a shortage of imported ingredients, then it is time to start taking this very seriously indeed. I've already noted several times that, with advanced planning, there is no need for there to be food shortages after Brexit, but keeping imports moving comes at the cost of shutting down much of our export trade. And, as I've also pointed out, if the Channel routes are disrupted, we cannot expect other ports to pick up the slack. Understandably, the focus today in on the 100th Anniversary of the end of the First World War – a war which, incidentally, was the intellectual cradle for the European Union. That war was supposed to be the war to end all wars but, after the second, we saw the belated emergence of the structures which were to become the EU, supposedly aimed at preventing another European war that could no longer happen in the traditional mould. A construct which has since submerged the very democracy that its founders supposedly sought to protect, a hundred years on we are facing a new fight to repair what is left of our democracy and bring life back into our politics. And, while we no longer have to confront the wholesale slaughter of trench warfare, it would be wrong to suppose that mankind has altogether forsaken violence. While rightly we celebrate the peace the 1918 brought us, and mourn the needless loss of millions of lives, we also need to recognise that, in its own ways, each generation has to fight for its liberties anew. And it fair to say that, given the intellectual genesis of the EU – born on the battlefield of Verdun - we will not be free of the shadow of the First World War until we have restored our own independence, and learnt to live harmoniously with our neighbours without the supervision of Monnet's Platonic guardians.